I was very bummed when we got more snow this week. These 45+degree days sprinkled here and there this winter has made me long for spring and I’m not much of a cold weather/snow person anyway (especially when school doesn’t get cancelled for it). 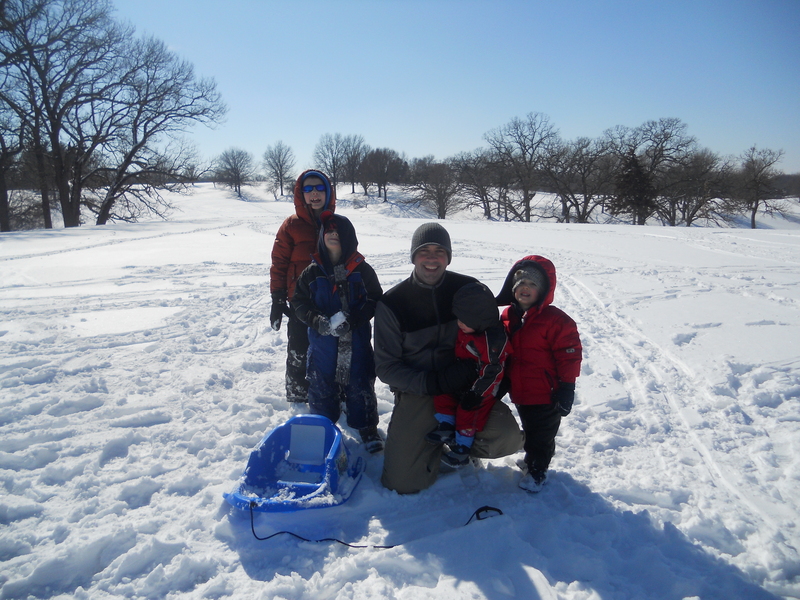 But of course the boys were excited for more snow because that means SLEDDING!!! 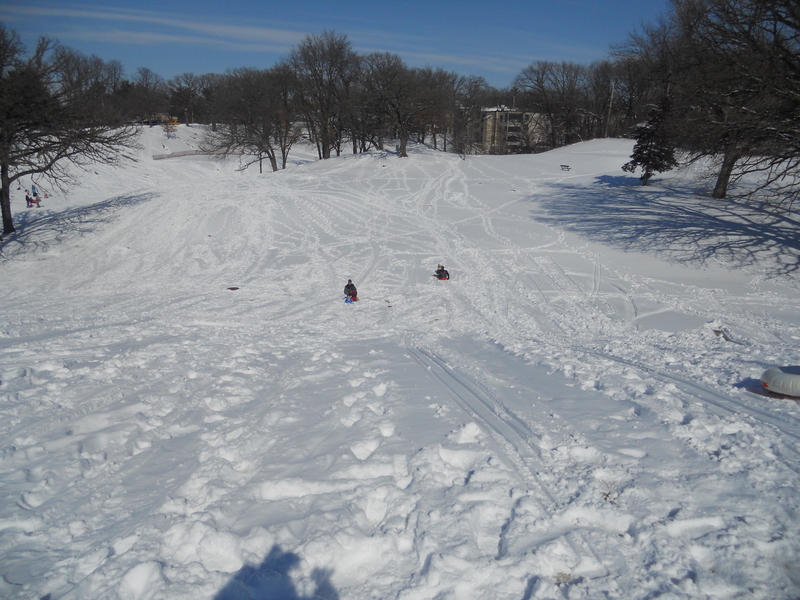 We live right down the street from a great golf course with huge hills that are perfect when covered in snow. (And I was very thankful for sunshine today. That makes the snow a bit more bearable). 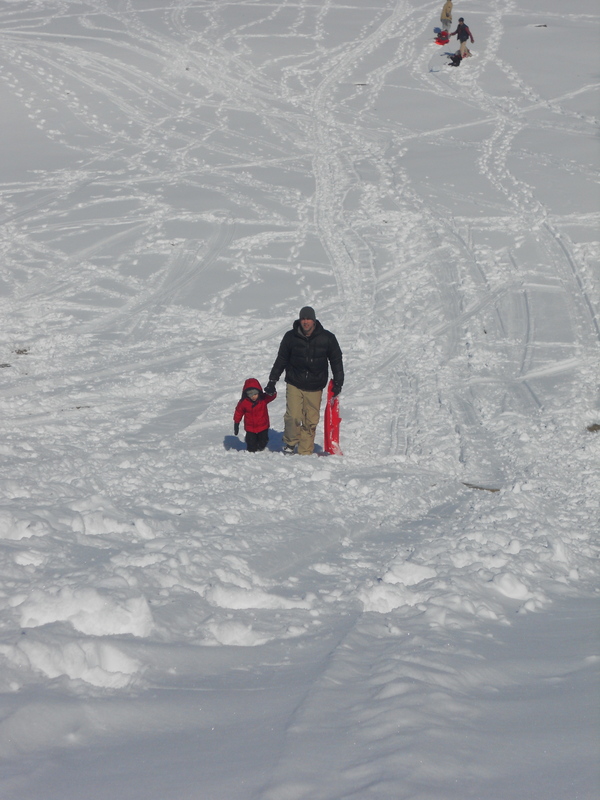 This was Sloane’s first time on the “slopes” and she loved it. 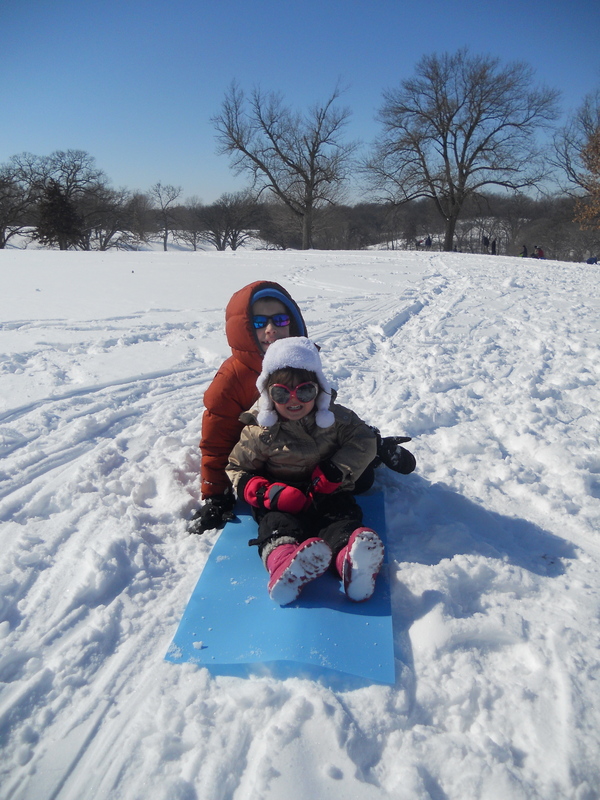 Gav and Cousin Eisley lookin hip even sledding. I swear that girl is the most stylish 2 year old I know! The only problem with going down………. is having to come back up. 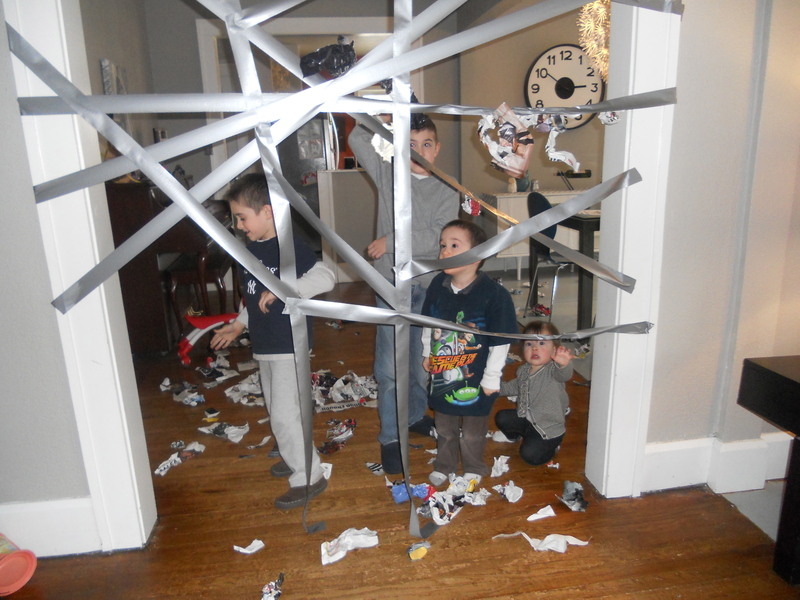 First make a giant spider web out of duct tape. Then tear up an old magazine and ball them into “spiders”. 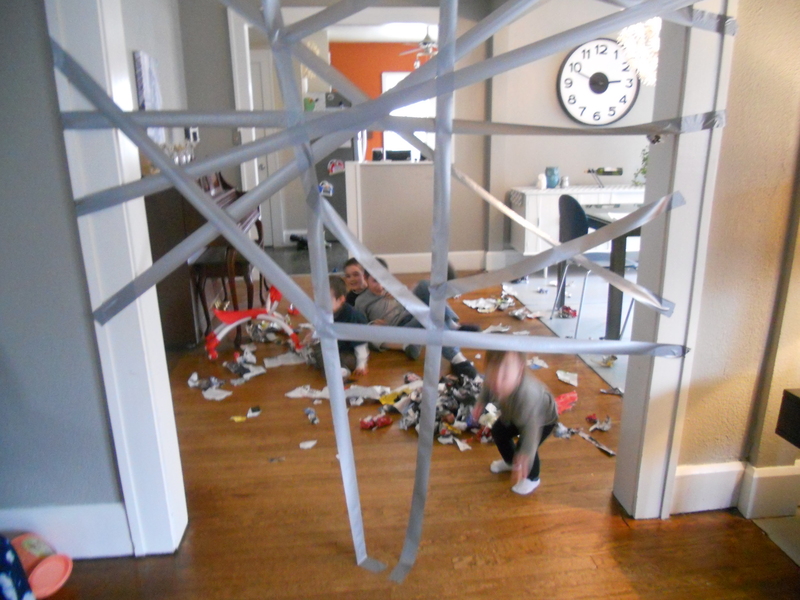 Toss the spiders onto the tape to stick. You can make all kinds of games/races out of this. I think the boys had more fun destroying the magazine than they did actually throwing the balls. Pretty fun and it kept them busy for almost an hour. 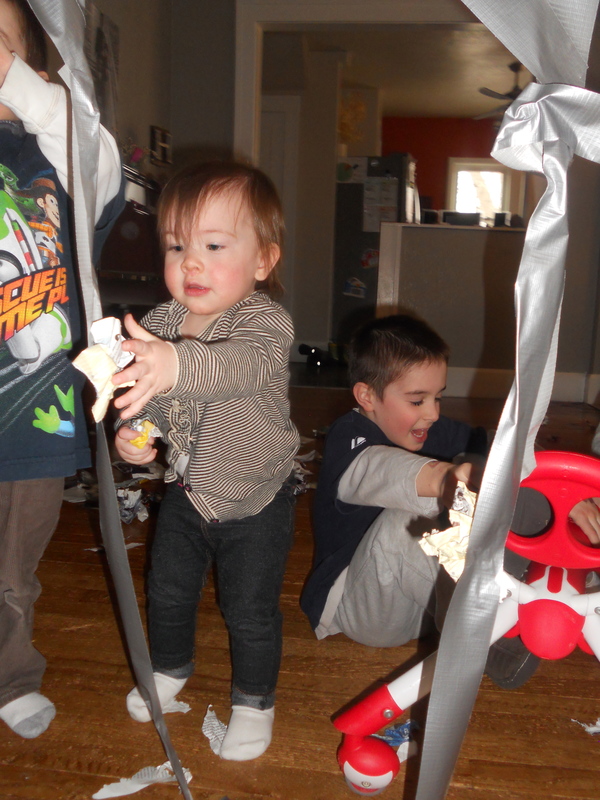 So you can see, everybody was in on the action, even the littlest. And when it was all said and done, she was the first to offer to clean up. Remember how I mentioned that Gav’s new speech therapist was already leaving us? Fast forward again to this past Monday (the day before our next therapy session with our new therapist). My mom tells me she met Gav’s new therapist at church. She’s actually friends with my sister. Here’s the kicker………she’s looking for a new job and is planning to leave. So our newest therapist (whom we haven’t even met yet) is planning her exit strategy. Once she was assigned Gavin, she put two and two together that Gav was Katie’s nephew. She felt so bad because she was familiar with our past situation and knew she was planning to leave too but she hadn’t told anyone yet so she couldn’t decline him as a client. She filled my mom and sis in on the situation and asked what she should do. So, there ya have it. The latest saga of our therapists. Since she’s not leaving YET and we haven’t decided what we’re going to do (is it time for us to leave??? )……we just decided to keep meeting until one of us ends up leaving. “M” seems really sweet and it’s a fun connection for Gav that she knows his aunt. I’m just very tired of all the unknowns. May 3rd Gavin is scheduled for his 3 hour diagnostic evaluation. This could possibly change everything. We’ve decided not to make any decisions until we see what his new diagnosis will be. Until then we wait…….and hope “M” sticks around at least until then. 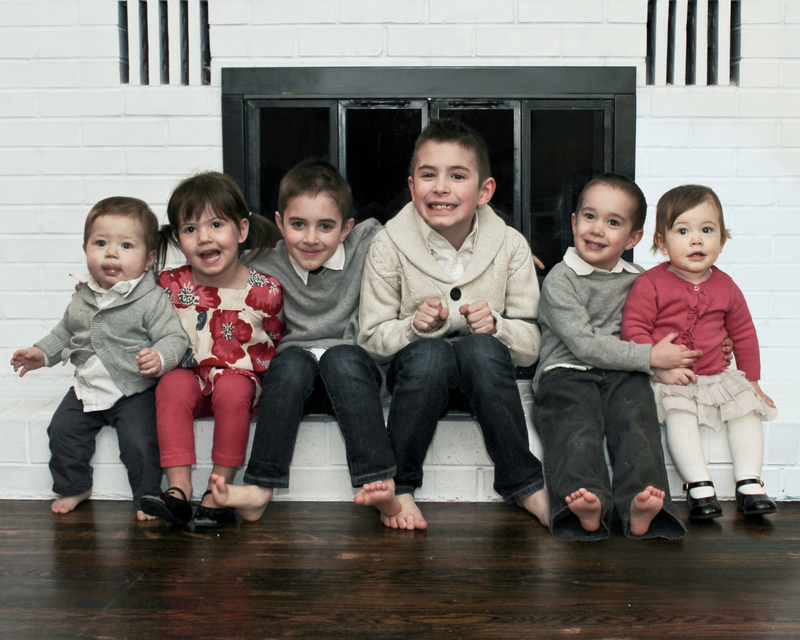 When you get the cousins together the room practically explodes with love and cuteness. Happy Valentine’s Day all. My heart is full. (Aaaaannnnnnd I’m also extremely glad I don’t have 6 children). Click to another blog if you don’t want to hear me blabber on about school anymore, because that’s what I’m about to do. I stumbled across this article online a few weeks ago. I read it and cried. All you have to do is change the names and you have our story. This problem is not just our isolated incident, it’s happening all over the country. As a whole, schools do not care for those children who are struggling. They are concerned with academics and test scores, making sure they are meeting the goals set by the higher ups. 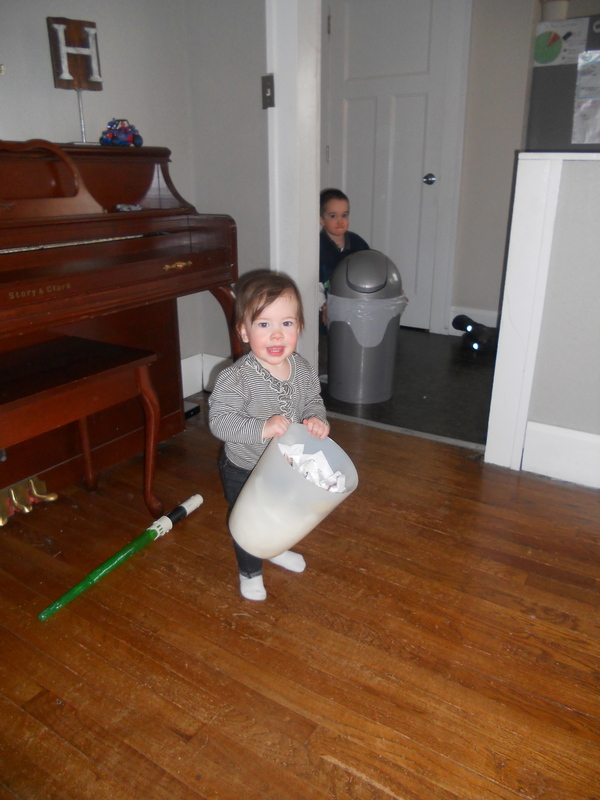 Kids like Henry….and Gavin, who struggle silently are being left to fend for themselves. I saw this countless times last year with Gavin’s clueless teacher. (And for the record, I have heard several more unsettling stories about this particular teacher from other parents so I retract my earlier statement that she just didn’t know how to help Gavin, because now I firmly believe she didn’t give a damn). I also want to state, for the record, that I have several very good friends who are teachers who truly do care about the kids who are struggling. I think they would agree with me when I talk about the school system as a whole failing our children. In no way am I counting out the teachers who truly are trying to make a difference. Have you seen Waiting for Superman yet? (I think I’ve mentioned this documentary before. It’s available for streaming on Netflix). If you have school aged kids PLEASE see this. It makes me thankful we live where we do but things are still SO bad everywhere. It saddens me deeply and I only see this problem getting worse. We were also hit with another blow this morning. Gavin’s new speech therapist (the one who came highly recommended by his last one) is leaving. Next Tuesday is her last session with Gav. She promised me she’d find someone else who would be a good fit. After all this, after all the changes we’ve seen over the past few months, I’m greatly wondering if our time here is done. I don’t know. I’m so in the dark right now. I left a message for Gav’s old therapist (ie:my favorite person who’s ever worked with him). I’m very interested to see what she has to say. And in my dreams she’ll tell me that she’s started her own company and will gladly take Gavin on as her first client…………..